There are 35 Historic Preservation Residential Districts in the City of Phoenix. Roughly bounded by Van Buren Street to the south, Missouri Avenue to the north, 19th Avenue to the west and 28th Street to the east, these districts tell the story of an evolving and growing Phoenix. The city has spread out from its early southern residential areas of the 1880’s which included Woodland, Garfield, Roosevelt, North Garfield and Oakland. By the early 1920’s it took hold in the center of town with Willo, Coronado, Encanto-Palmcroft, Alvardo, Ashland Place, East Evergreen, F.Q. Story, Los Olivos and Windsor Square. From the late 1920’s, residential areas continued to expand to the north and fill in around the existing districts. If you live in one of the Phoenix Historic Preservation Districts, you know the meaning of upkeep and maintenance. The older homes are unique and individual in style but need constant fixing, redoing and updating. It never ends. And so it is with each of us. At Willo MediSpa, we offer solutions for prevention, correction and maintenance of aesthetic needs for men and women. We can help you look on the outside the way you feel on the inside. BOTOX® Cosmetic treatments can soften the dynamic wrinkles that can turn into deep etched lines on your forehead, between your eyebrows and around your eyes. Dermal fillers from the JUVÉDERM® Collection of Fillers and RADIESSE® (+) can augment sunken cheeks and temples, enhance lips, soften marionette lines and nasolabial folds and restore volume to the dorsal surface of your hands giving you a more youthful overall appearance. KYBELLA® (deoxycholic acid) injections can reduce the submental fat that cause a double chin. Medical grade skin care products from SKINMEDICA® and NEOVA® can help reverse the signs of dull aging skin such as fine lines, fine wrinkles, pigmentation issues and poor skin tone and texture. LATISSE® will draw attention to your eyes by helping your lashes grow longer, darker and thicker. Other services we offer include B Vitamin Injections, Sermorelin and Testosterone Replacement Therapy for men. 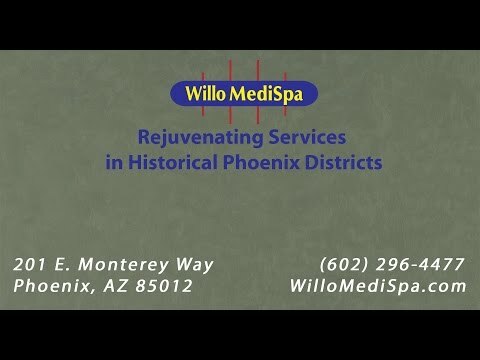 Willo MediSpa is in the heart of the Phoenix Historic Preservation Districts at 201 East Monterey Way, Phoenix, AZ 85012, near the Osborn and Central Light Rail Station. We are located two blocks south of Osborn Road between Central Avenue and Third Street in an area called Monterey Medical Plaza. Our adobe block building, built in 1956, has a warm and relaxed feeling that will make you feel comfortable and welcome. To schedule a Complimentary Consultation for any of our services, call us at 602-296-4477, email us at customerservice@willomedispa.com or contact us thru our website at willomedispa.com.